Having walked by Artisan Noodle on numerous occasions and seeing waiting throngs, it’s apparent the restaurant’s good. Of course, its small dining room that seats less than 20 people likely isn’t helping alleviate the long lines either. Trust me, if there’s only a couple of people ahead of you, the wait is worth it. 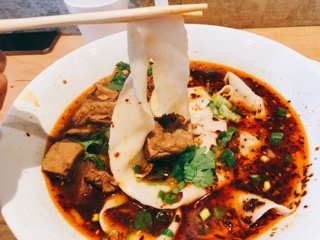 Surprisingly, for such a small establishment, they have a surprisingly large menu dedicated to the biang biang hand-slapped and pulled noodles originating from China’s Shaanxi province. 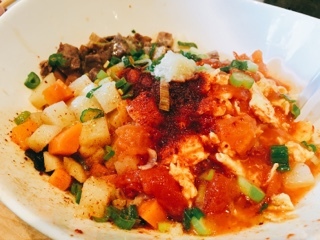 The namesake biang biang mian ($8.99) features the noodles topped with a cacophony of ingredients: diced root vegetables, tomato, beef, scrambled egg and scallions. You mix everything around vigorously creating a light dish suitable for warm weather. My husband enjoyed the dish, but its lukewarm temperature and absence of soup made me want something else. 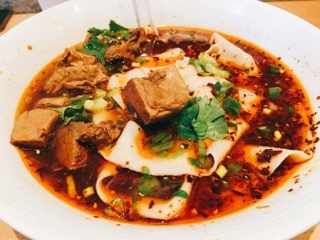 If you can handle the heat, the spicy stewed beef noodle soup ($9.99) is good. The beef broth salty and satisfying, the noodles simply adorned with tons of tender beef, scallions and cilantro. I only wish the spiciness wasn’t derived from chili oil as the slick layer of it floating on top made it difficult to enjoy the soup. 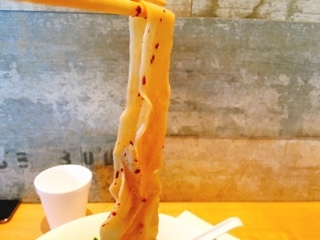 Artisan’s noodles are a remarkable length (good luck trying to eat it in a mouthful) and unlike the knife shaved style, their thickness remains consistent throughout. Springy but still soft, the noodles are substantial and leave you full afterwards. A great first experience with biang biang noodles. So good that I plan on returning to Artisan Noodle to try the stir fried version. Hopefully, we’ll be lucky again and miss their long lines.